Recently on two separate TV shows I saw an image file used to hide other data (one was text and one was another image). Wouldn't you know, I then ran across ZomgStuff and a post from UgLy NeRd, which has an article on how to hide a text file in a .jpg. It is actually quite easy: use RAR to merge the two files, giving it a .jpg extension (copy /b secret.jpg + meeting.txt.rar lizard.jpg). When you want to retrieve the text, open the .jpg with WinRAR. Check the posting on ZombStuff to see a few screen shots. For nearly a year, the FCC has not approved the AT&T / BellSouth merger -- more specifically commissioners Michael J. Copps and Jonathan S. Adelstein. In order to break the deadlock, AT&T has put forth provisions to make the merger look more favorable to consumers. This is the second set of conditions that AT&T has put forth in order to get the merger through -- the first being in October. The most exciting part of the provisions this time around is AT&T's partial support of Net Neutrality. According to Nate Anderson of ArsTechnica, this provision means that all content of a particular type will receive equal bandwidth. What it does not provide is equal bandwidth across different content types. For example, AT&T could throttle back all VoIP, and give more bandwidth to video. The good news is that companies cannot pay AT&T money to deliver their content faster than another content provider. Vista has not even been released to the consumers, and already there is a work-around to keep you from having to activate your copy. As you may recall, if you do not activate your copy of Vista within Microsoft's specified time, you will be reduced to an OS that lets you access the Internet for an hour at a time. 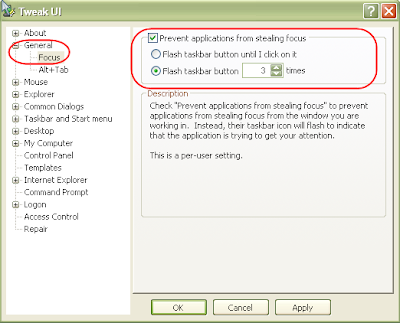 On December 20, 2006, KezNews posted an article on how to fool the activation clock, and therefore allowing you to run Vista without activation indefinitely. If that is not enough, KezNews has a synopsis of the eWeek article on how hackers can buy Vista exploits for $50,000. I am not suggesting you steal or try to hack Vista; rather, I am suggesting you be careful in seriously consider before upgrading to Vista. With a completely new platform, Microsoft can claim that Vista is the most secure Windows platform ever (the same claim they made about XP), but the fact is, Microsoft has no idea how Vista will stand up to hackers -- only time will tell. Most adults do not believe in Santa, because they do not understand how he can deliver presents to so many homes, all in one night. That's because most of us are not as smart as Santa and Dr. Larry Silverberg of North Carolina State University. 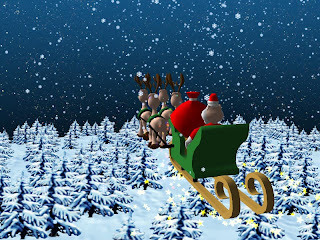 Mick Kulikowski released an article earlier in the month, after speaking with Dr. Silverberg, that attempts to explain the science and technology behind Santa Claus' travels to the layman. "...Santa has a personal pipeline to children’s thoughts – via a listening antenna that combines technologies currently used in cell phones and EKGs..."
Santa uses this information on his sleigh, so that he has up-to-the-minute information just before he builds a present for a child. Yes, Santa uses just-in-time manufacturing with nanotechnology to build the toys once he is in the home of each and every child. Of course that does not explain how Santa Claus can complete this all in a single night. The popular, safer alternative to the Outlook Express mail client Thunderbird, from the Mozilla folks, can be used for more than just POP3 / SMTP mail. If you did not know, Google provides POP3 access access, but all the other popular WebMail platforms do not. Lucky for us, Mozilla has developed Extensions to support the other popular WebMail formats from Yahoo to HotMail to AIM/AOL. Mozilla has made it fairly easy to setup too. First, you download their base WebMail Extension, and then individual Extensions for only the services you have. After the Extensions are installed, you have a new option, WebMail, in the Add Account interface, which takes you through a Wizard to configure. That's it!. I setup and tested both Yahoo and AIM/AOL. The only thing to watch for is that you enter your complete email address for the username (i.e. yourname@yourservice.comnotyourname). The new release of Firefox, version 2.0.0.1, which was released December 19th, still has problems running on Vista. The biggest problem is that it cannot be set as the default browser. It almost seems as if Microsoft purposefully changed things to make it more difficult for Firefox. According to W3Schools, Firefox had nearly a 30% market share in November, number two after IE 6's 50% share. You may recall that September 20th of this year, I suggested that you should not be the first to take new software updates -- let others see if there are problems. In this case, I was speaking of iTunes 7, as many people were having problems (and on Apple's Discussions forum) with the popular software. About a month ago, I finally installed iTunes 7 on the PC that I did not sync with. The new software seemed to work well, but I had no reason to update my PC used to sync my 3rd generation iPod. Yesterday, I finally took the plunge -- 3 months after my warning. Everything seemed fine, the software loaded fine, my iPod seemed to sync okay too. This morning though, I found a problem -- I no longer had Podcasts listed as an option in the playlist. Fortunately I could scroll through recently added songs and find my podcasts. I recommend you disable third-party cookies to avoid companies, such as DoubleClick, from tracking your behavior across sites. Open About:Config, and use the Filter dialog box and type network.cookie.cookieBehavior (it will be the second item once you have entered network.c). 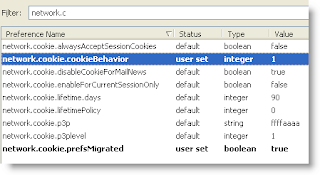 Double-click on network.cookie.cookieBehavior and change the value to 1. This will now permit only cookies from the same domain you are visiting to save cookies on your computer. I ran across a site, StopBadware.org, led by Harvard Law School and Oxford University, with sponsorship from Google, Sun, and Lenovo, that is trying "to become a focal point for developing collaborative, community-minded approaches to stopping badware." In speaking with an old friend today, I was reminded of how unsafe it can be to use an unprotected wireless connection, or even worse, an Internet cafe' PC. So when I got home, I researched some of the services and solutions that I have read and heard about. First of all, you should always take caution when using an open network. This includes both wireless and wired (such as a hotel). The best way to do this is by setting up a Virtual Private Network (VPN) before doing anything else. If you are a business person, you may already have that capability through your company. If so, check with your IT department to find out what happens when you connect to non-work addresses. Typically it will skip the VPN and go directly to the site, saving company bandwidth, but putting you at risk. Note that there may be a way to change this setting. As reported by IntelliAdmin.com and ComputerWorld, another security hole has been found in a Microsoft product -- this time it is Windows Media Player Versions 9 and 10. Specifically, the problem is with media files that have the .asx extension. By default when you click on this file type, Windows Media Player will launch -- a compromised file would allow hackers to gain control of your PC. IntelliAdmin.com recommends that you remove the association for Windows Media Player to play .asx files. Microsoft recommend that you upgrade to Windows Media Player 11. Microsoft says Windows Media Player 11 will work on all versions of Windows XP that have Service Pack 2. I did find one mention of possible problems if you have Windows XP Media Center 2005. 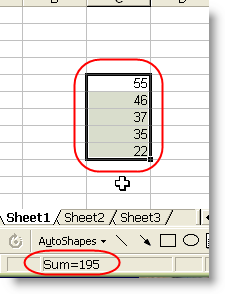 I found an old trick in Excel the other day... if you highlight cells, the sum will appear in the status bar below. This works whether the cells are horizontal, vertical, or in a block. You can also select cells to sum from various parts of your spreadsheet by holding the Ctrl key down as you select each. As reported by eWeek and ZDNet, there is a new problem with Word that could allow attackers to take control of your PC. Since there is no fix available yet, you should avoid opening any unknown Word files. I would expect that Microsoft would release a fix as soon as possible, but if they stick to their patch-Tuesday schedule, this may come to late to make the December release, forcing users to wait until January. I have been working with an Excel file for about 18 months -- each month I link to a monthly Excel data file. This gives me data in one file that I can use to trend many different segments. I am not sure when, but this file had ballooned to over 3 MBs. Finally this month when I tried to upload it to our intranet, I received a file size limit exceeded message. I searched and searched, and could not find any thing that would compress or clean up the file. Finally I went to Google and found a solution. The credit goes to OzGrid Business Applications. Here is a link to the entire article, and below is what I had done to reduce the file size. There is an excellent article posted by the Electronic Frontier Foundation that describes how poorly implemented security is not better security. Trusted Computing: Promise and Risk by Seth Schoen reminds me a lot of DRM. The direction of two organizations, Microsoft Next-Generation Secure Computing Base or NGSCB and Trusted Computing Platform Alliance or TCPA, want to put restrictions in place that could force you to use certain software by certain manufacturers. Of the fours security areas: (1) memory curtaining; (2) secure input and output; (3) sealed storage; and (4) remote attestation, remote attestation could be a problem. Developers could force you to use certain software in order to use their system. The author recommends adding an owner override to prevent problems. Read the article yourself to learn more. A while back I had reported difficulty with the reliability of my wireless connection. I learned that different channels may perform better than others, and by switching, my wireless connection is much more reliable. There are also various tools that can help the educated person with their wireless network. NetStumbler is one such program. With NetStumbler, you can test the signal-to-noise ratio (SNR). The higher, the better (i.e. a lower number is bad). Did you know that you could use your Gmail account to store files? With nearly 3 GBs of space, this is an easy way to store files that you may want to access from multiple computers or that you want to make sure get archived off site. Rahul Jonna has created a simple Firefox Extension, making it very easy to store files from Firefox. I made a 1.5 minute how-to movie to demonstrate how this works. [The quality of the movie does not match my desire, but I had to use a program that would output a format that could be accepted by Google.] Be sure to watch the last 3rd of the video as it demonstrates how to write a filter in Gmail, so the files do not show up in your inbox. I listened to a wonderful podcast yesterday (you can listen online too), provided by Gigavox' IT Conversations. Michael Copps, an FCC Commissioner spoke about Network Neutrality, Broadband and Media Ownership. This guy really gets it. We need to find ways to support Mr. Copps, and find more leaders like him. I highly encourage you to listen to the podcast -- in particular if you do not understand the issues, I think you will once you have listened to Mr. Copps. Federal Communications Commissioner Michael Copps states that all is not well in Washington when it comes to technology policy. He argues that the continued trend in media consolidation, with fewer organizations owning more and more properties that allow them to control both content and distribution, will be further exacerbated by recent decisions by the FCC. CNet reported on October 25th that a new spoofing bug has been reported for IE7. The basic issue is that the displayed URL can be coaxed to looking like a legitimate URL when in reality it is hitting an undesirable website, i.e. phishing. CNet's source is Secunia, a security company. Did I tell you that Mozilla released Firefox 2.0 on the 24th? I recently posted that I would recommend staying with Windows XP as long as possible. Well if you buy a PC now, it is likely that you will get a coupon for a free upgrade to Vista when it ships. I would be very leery of what "free" really means. As you may also recall from my prior posting, I suggested you should wait as long as possible so that Microsoft can correct all the security issues -- there will be security issues. PC World published on October 24th a good reminder about the new Vista Home Edition -- it will have less features than XP Home. So, for your free version, you can upgrade to an OS with fewer features. Why would you want to do that? The November issue of Wired has a great article on "Building a Better Battery". John Hockenberry begins with a story of a battery that catches fire, and then takes us to the first battery built in the 1800s. Hockenberry quickly takes us through the history to the point of talking about lithium-ion. Today, most Li-ion cells contain at least two – and sometimes three – separate countermeasures to keep the reaction from getting out of control.Finally, we hear a bit about Sony before Hockenberry concludes with the current research in battery technology. CNet reported on October 23rd that Sony has even more battery recalls. Batteries that shipped with laptops sold by Fujitsu, Gateway, Sony and Toshiba comprise this recall... ...worldwide tally... ...more than 3 million...This extends the list to Dell, Lenovo/IBM, Apple, Sharp, Fujitsu, Gateway, Sony, and Toshiba. If you have been reading my blog, you know that I do not recommend being an early adopter of new software. I let others try it first, and wait to hear the news. For example, I still have not updated to iTunes 7. Likewise, I will wait as long as possible before getting Vista. On a side note, if you are thinking of getting a new PC, I would recommend you get it now before you are forced to take an early version of Vista. You want to wait as long as possible until the majority of the security issues are solved.Anyway, back to Firefox... I have installed version 2 and have used it both at work and home without any problems. I did have to update an extension and removed the anti-phishing, as it is now built into Firefox, but other than that all is good. I figured that I could find all the lithium-ion battery recalls by looking at the U.S. Consumer Product Safety Council website -- I was wrong. Here is what I found, but it is missing quite a few. It is unfortunate that this website is incomplete. The U.S. Consumer Product Safety Council also released tips on notebook computer usage in September of this year. Interestingly enough, I found a laptop battery recall as far back as 1994. For those of you who are interested, the U.S. Consumer Product Safety Council has new recalls announced each week. You can sign up for an email or even subscribe to a podcast to listen to the recalls. Download Microsoft's Virtual PC and load FreeDOS or another DOS. (Virtual PCs only provide the hardware visualization, you still need to provide the OS. )Use the VM Player and run the Nostalgia appliance. This appliance comes pre-installed with OpenDOS and 8 old DOS games. Use the VM Player and run the FreeDOS appliance (beta). On a related note, apparently there are some hacks you can make to the VM Player environment to create new environments without purchasing the client. My wife and I bought the same model computer this past summer (HP Compaq Presario, Win XP Media Center), and while I have had no problems, she seemed to have many. The first problems was that her computer seemed to lock up when accessing the Internet. After several different tries, I ended up re-imaging her computer, and that seemed to do the trick. Within a month though, she started having memory problems: "Insufficient system resources exist to complete the requested service." After doing a bit a research, I concluded that the problem stemmed from the new multi-function HP printer we bought. HP kindly [grrr...] installs a java-based server and application to monitor the device. And because it is so important, HP installed it in the system tray upon startup, so it is always available. EWeek reports a new trojan virus that removes other viruses from your computer. The creators of the trojan virus want to use your computer to send spam email, and do not want to share your computer with other malware programs. This is accomplished through downloading KasperskyAntiVirus for WinGate and modifying it to skip over itself. Remember a few weeks back when Apple released iTunes 7 and Windows users had several problems? My advise at the time was to never be the first to download a new product version; wait for others to give it a try first. BTW: Apple has already release iTunes 7.1, but I still have not updated, as there are still some issues for listening to podcasts. Well, Microsoft just released Internet Explorer 7, and a bug has already been reported. Apparently the problem manifests itself in Outlook Express, but because the two are closely integrated the cause was from IE 7. Never be the first to try a new version of a product (if you really must, test it in a sandbox first)Use Firefox, not Internet ExplorerUse Thunderbird, not Outlook ExpressAny questions? Apple reported today that some versions of iPods (and here) manufactured on September 12th inadvertently went out with a Windows virus. From the sounds of it, you should be fine if your virus definition files are up-to-date. After many months, Sony has finally issued a recall of their batteries in their Vaio laptops. The list of companies who have recalled Sony batteries now include Dell, Apple, Toshiba, Sharp, Fujitsu, Lenovo, Hitachi, and Sony. The only major manufacture that has not recalled Sony batteries is HP, which is a bit odd considering all the other manufacturers eventually placing a recall. As you may recall, Sony originally said the problem was limited to Dell, and then Dell and Apple. Seem just a matter of time before HP is part of the crowd too. U.S. Today posted on article on October 2nd that indicated Sony will end up replacing 10 million batteries. Here's some fun, old PC ads put together by PC World. Have you ever wondered why you need many of the Services running in your Windows XP environment? Or perhaps you want to know if you can disable any to gain some extra performance. I have scoured the web, viewing article from Microsoft and The Elder Geek; I have also used my own reference materials and notes that I have collected over the years; and have produced a description and recommendation for each of the Services in XP. If you consider yourself an average user, stick with the Standard recommendations. But if you are a Power User or Gamer, there are recommendations for you too. Undoubtably you will find a service that is not listed, if so, try searching Google. And I am sure you will have a difference on some setting or another... well that is okay too. For the Power User, this should give you enough information to make your own decision. I found some good tips for power users of XP, 20 Things the average person doesn't know about XP. The tips include how to speed up the time it takes for XP to expand the Start menu; to how to configure Delete to delete, not send files to the Recycle Bin; to how to enable Clear Type. This is well worth adding to your XP toolkit. Firefox has a very powerful bookmark feature. By simply giving the bookmark a keyword, you can reference it in the address bar, instead of searching through your list or typing the URL. You can extend this functionality and have it take a variable. Let me tell you through a few examples. First bookmark a site, say this one: http://the-cream.blogspot.com.Now open up the Bookmark Manager (or find the bookmark in your list) and open the Properties field.Add a keyword and save it (OK).Go to the Address bar, type in the keyword and hit enter.You should now be directed to this site.Let's try another example. Suppose you want to see all the blog posts specific to one label (i.e. Firefox or security). The URL to view all the Firefox blogs is: http://the-cream.blogspot.com/search/label/Firefox. Create a bookmark with this URL. Occasionally we all have a bad day -- maybe we send an email with some embarrassing typos, or we get a flat tire, or maybe an argument with our boss. But when millions of people count on you for their PC to be secure, you cannot afford to have a bad day. Unfortunately for Windows users, that is what Microsoft had today (and here). Microsoft was supposed to automatically send 11 fixes, 6 categorized as critical. You already know how I feel about Internet Explorer -- do not use it. And recently, I have changed to Thunderbird for my email. If you are on the Internet, do not expose yourself with Microsoft tools. In some future post, I will talk more about Thunderbird -- for now, know that the upgrade went without a hitch plus I found that I like the RSS reader included, too. The prior XP keyboard shortcuts was so popular, I decided to update it. The new Windows XP Keyboard Shortcuts file has 23 new shortcuts. In addition, it is now in a handy tri-fold format. Print the two pages on a single sheet of paper, fold it up, and you have a very handy desk reference. Though it is in color, it looks good in black and white too. Speaking of shortcuts, here is a good reference for PowerPoint keyboard shortcuts courtesy of Florida Gulf Coast University. Seems like every time I work on a new XP system, I have to re-figure how to get the folder settings the way I like it - the way it worked in prior versions of Windows. So for the benefit of others, here is how you do it. I occasionally speak with people that are having problems managing their email -- usually these are the people that do not respond to your email or miss an occasional meeting. I started recommending a series from 43 Folders on managing your email, and these folks are having success. The series is called Zero Inbox. 43 Folders' Zero Inbox takes you through a fairly simple 10 step process that will lead you email success. If you find Zero Inbox helpful (or maybe you do not need it), checkout other "life hacks" such as building a smarter to-do list or procrastination dash. Procrastination... hmm... maybe that is a better place to start. What are you waiting for? Give 43 Folders a try. Wondering why you just received the last 25 posts in your RSS feed? I just moved Skimming the Cream Off the Top to Blogger's new beta, and apparently that triggered some feeds to think I posted 25 new articles. Sorry for any confusion. Update Oct. 3: A recent article from eWeek suggest that the claimed bug in Firefox may be just a hoax. Naturally the Mozilla folks are taking this seriously until they can absolutely rule out that their is no issue. 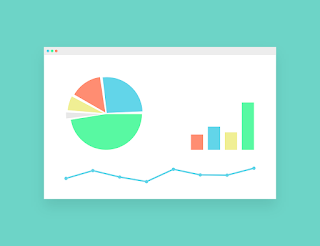 Many of us have used Excel for things where a better tool is available, such as using it for a database. We have also not done a good job in learning about all its powerful functions, nor how to leverage its powerful programming language. Well, I have found a site that has used Excel in a non-traditional way, but surely in this effort, learned how to use the powerful programming language. Of course I am talking about using Excel to play Pacman. I cannot read Japanese, so I cannot give you any more details, but this is truly a novel approach.